George Alexander Louis. Born July 22, 2013. Prince or no prince, the name is fortunate and quite serendipitous. The date of birth offers some challenges, especially during the early part of his life, but he will walk a promising path. Or at the very least, it promises to be full of surprises. As It Happens: Royal Numbers! George's Life Path is an 8 based on 35. One of the most misunderstood numbers in numerology is the 8. Most people with some knowledge of this science hook into the idea that the 8 is all about power and money. The 8, however, is much more than that. First and foremost, it is the number of balance, of cause and effect, of divine justice, and of righting wrongs on all levels. Even looking at the shape, an infinity symbol precariously "balancing" on one end, reflects its true nature. And yes, it does project its influence most visibly on the material and physical world. Hence its connection to money and power. But it does so from a lofty, spiritual perspective. It can bring financial disaster just as quickly as it brings wealth. It can empower you, or it can turn you into a perpetual victim. It is never neutral. The 8 is the pathway between the spiritual and the material worlds. Simply put, it understands the physical world. For the future prince or king, or for anyone with an 8 Life Path in his or her numerology chart, the advise is that without generosity, you will not fare well financially. Without humility you will find your power to be a burden. And if your 8 is based on 35, as is the case with this future king, your success and accomplishments will come from a combination of creativity, individuality, and in particular a strong rebellious streak. In fact, it is precisely the 3 and the 5 hiding behind this 8, that makes this a promising Life Path, as both are idealistic, unconventional numbers. He will not be a conformist. He will be opinionated and a bit of a trouble maker. His parents have their work cut out for them and he will not live according to anyone's expectations. This little fellow is on a life path that promises adventure and battles. He will enjoy demolishing dogmas and concepts that have survived for centuries. The 35 brings a breath of fresh air wherever it goes. His first Period cycle, until his late twenties, is 7. His first Pinnacle an 11, and his first Challenge a 3. These numbers strongly affect his personal growth pattern; his path, so to speak, and show a childhood that is about as contrary to his 8 Life Path as could possibly be. The direction of his life certainly points towards authority and responsibility as reflected in the 8, but the first 28 years or so, he will not remotely reflect that kind of individual. As a child and young adult, he is sensitive and vulnerable. His emotions rule his mind. He will feel a little distant and have difficulty expressing himself. He is not a talker, he is introvert and shy and will make excuses to avoid as many social events as possible. But he is by no means weak. From an early age, he will be an excellent and knowledge-hungry student, preferring books over movies. However, he is not the typical "good" student, but more likely inquisitive, unruly, and at times argumentative with his teachers - in spite of his shyness (much of which will be gone by age 14 or 15). He will, even for a child from his generation, be extremely computer savvy. And, much like his grandfather, he is an idealist who seeks and understands balance in nature and elsewhere. 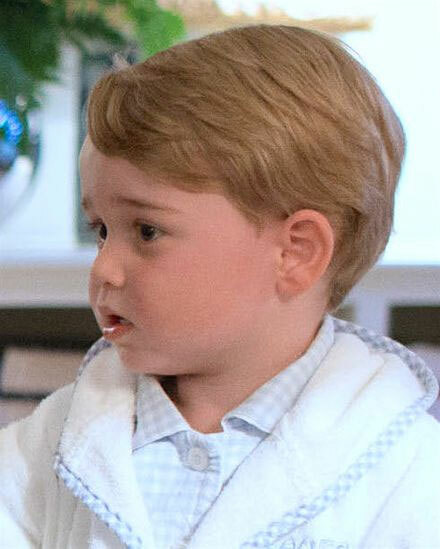 But contrary to Charles, George will not be a gardener. Working the dirt and the things that grow from it, is not where his interest lies, but the science behind it is certainly is. His most difficult years, emotionally at least, will be ages 22 through 24, when self doubt and self criticism make him indecisive and insecure. The most obvious and important change in his personality takes place around age 29 and 30, when he enters a 22 Essence cycle and a 22 Period cycle at the same time. There is little doubt in my mind that he finds his "purpose," and aims for it with everything he has. And he will set his aim very, very high indeed. The middle part of his life reflects a battle of wills and huge risks. It is the mental, emotional, and spiritual manifestation of nothing less than a King Arthur-like round table enterprise. His 22 Master number Birth Day and 22 Second Period cycle leave no doubt that his actions will make a huge impression on the world around him during that time. Thus far, I have talked about the numbers derived from his date of birth. These are the numbers that reflect his "path," his personal evolution or growth, so to speak. And since Creation always bestows upon us the qualities needed to follow our paths, the aforementioned traits are part of George's makeup. However, these traits are highly changeable, come and go as needed, and can be seen as the equipment with which we travel. It is in the name that we find the numbers that reflect our talents, strengths, shortcomings, idiosyncrasies, personal preferences in lifestyle and otherwise, and anything else we would consider to be part of our personality. When you combine a 1 Heart's Desire with a 1 Expression, it creates a masculine, driven, ambitious energy that is not always easy to control. Fortunately, your 9 Personality tempers it somewhat with compassion, empathy, and tolerance. Still, to have that much 1 energy can be a burden at times. You are not afraid to confront others and, especially in your younger years, may have had some volatile moments. The upside of this powerful energy is an ability to overcome obstacles and push yourself well beyond a point where most people would have given up. You have courage, and leadership qualities. You are idealistic with just enough realism to be practical. You are independent and individualistic, and will leave home to pursue your own path earlier than most. But whereas you value your own freedom highly, you may have a tendency to infringe on that of others, or try to control them through sheer will power. You are a difficult and demanding boss, but an even more difficult subordinate. You are happiest working for yourself, or at least in a position with little oversight and little interference. Your 9 Personality softens the edges of your 1 Expression and 1 Heart's Desire numbers considerably, and makes you more approachable and likeable. Had your Personality also been one of the more forceful numbers, like 4 or 8, you would have a much more difficult time keeping yourself on the straight and narrow. Thanks to your 9 Personality, you have a sense of responsibility towards mankind as a whole and are well suited for the legal fields, law enforcement, and engineering. Although you are likely to be drawn to politics, or any other environment where you can make changes and satisfy your idealism, you are probably too direct to ever be successful as a politician. A freelance consultant or lobbyist would be more suitable. In your personal life, you are fiercely loyal and protective, but you have to guard yourself against becoming possessive and jealous. This was written for a person with George's numbers, but nor per se to a future king. So it is interesting that the statement about being drawn to politics, but too direct to be successful in that field, might indicate that perhaps he will apply some of the muscle given to him by birth to influence English politics and society - well beyond what is pretty much to be expected from any monarch. Also notable is that not only does his date of birth produce an authoritive, powerful number, his name gives him powerful numbers as well. But they are different in nature and in the way they affect him. The 1 is a warrior, a fighter, it's confrontational and hardheaded. It is a spear point, a doer, and when it expresses itself negatively, it's an overbearing bully with a volatile streak. The 1 is the most masculine of all numbers. This number is built into his personality. The 8, the number for authority, business, control, balance, and finances, rules his path and therefore forces him to deal with these issues. Similar on the surface, very different when you take a closer look. What stands out most in my mind, is that his name numbers are truly royal. The 1 and 9 combination is a warrior (1) with global consciousness (9). A fighter (1) who is tolerant and has great empathy for mankind (9). It combines the defender and protector of the underdog (1), with the "Mother Theresa" number (9).